We are excited to present our brand new Entredeaux technique. 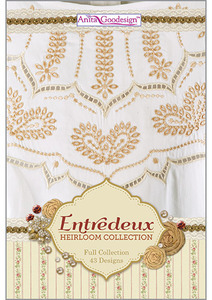 In French the defiition of Entredeaux is “between two”, the technique is very popular in heirloom sewing to join pieces of fabric and lace trims together. We have created a technique that allows you to create delicate Entredeaux stitches on your embroidery machine. The technique is similar to our cutwork technique with the addition of another cutting stitch. Since the Entredeaux stitches are so thin the additional cutting stitch allows you to trim any fine threads or fibers. There are 43 different designs including border designs that can be used to accent the Entredeaux designs. These designs look beautiful on clothing or home decor items like tea towels. 43 Designs Total – for the 5”x 5”, 6”x 10”, 7”x 11” and 8”x 12” hoops.